Kybella is the first and only FDA-approved non-surgical injectable drug that treats moderate to severe submental fullness, commonly referred to as “double chin.” It is made of a synthetic form of deoxycholic acid that targets and eats away fat. Naturally found in the body, deoxycholic acid helps the body break down and absorb fat. Identified as a cycolytic drug, Kybella targets and destroys fat cells. The approved area for Kybella treatment is the subcutaneous fat in the upper neck, submental region, or the area under the chin. The use of Kybella apart from the submental area is not medically approved or recommended. More so, the use of Kybella outside of the approved area is not guaranteed safe or effective. Submental fullness due to submental fat, sometimes referred to as ”double chin,” is a common yet undertreated facial aesthetic condition. It can detract from an otherwise balanced and harmonious facial appearance—leading to an older and heavier look. 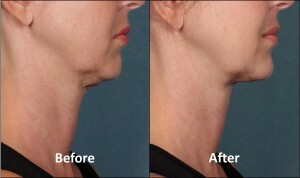 Submental fullness or double chin can impact a broad range of adults and is not limited to people who are overweight. This condition can impact men and women of average weight and can be caused by aging, genetics and weight gain. It is often resistant to diet and exercise. According to a 2014 survey by the American Society for Dermatologic Surgery (ASDS), over 2/3 of consumers are bothered by having a double chin—nearly as many as those bothered by lines and wrinkles around the eyes. Kybella treatment or liposuction for double chin? Which would you recommend and what is the difference? There are many considerations when determining which procedure would be more appropriate for each patient. Treatment with Kybella is a good option for patients who do not wish to go under the knife. Both liposuction and Kybella are curative procedures and remove a number of fat cells. The Kybella treatment is less invasive than liposuction but typically requires more than one treatment. If there is a large amount of fat in the area, liposuction might be a more appropriate procedure. The best way to determine which procedure would be right for you is to schedule a consultation, so we can evaluate the treatment area and discuss the treatment options in depth. Kybella (deoxycholic acid) injection, also known as ATX-101, is the first and only FDA-approved injectable drug that contours and improves the appearance of submental fullness or double chin due to submental fat. Kybella is indicated for improvement in the appearance of moderate to severe convexity or fullness associated with submental fat in adults. The safe and effective use of Kybella for the treatment of subcutaneous fat outside the submental region has not been established and is not recommended. 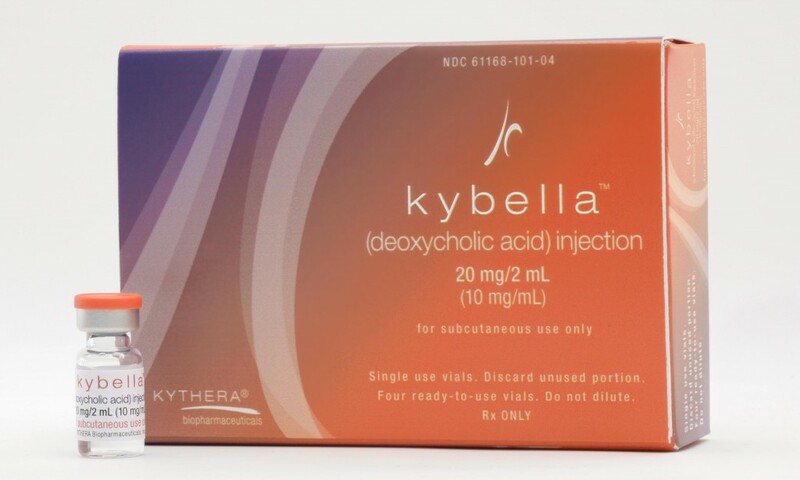 When injected into subcutaneous fat, Kybella facilitates the head-on destruction of fat cells. Once destroyed, these fat cells will cease to store or accumulate fat. After the aesthetic response is achieved, retreatment with Kybella should not be necessary. Due to its cytolytic activity, Kybella should not be injected into or in close proximity with vulnerable anatomic structures. Kybella is administered by injections in the fat under the chin. A single treatment may consist of up to 50 injections. This is introduced into the body with the use of single patient vials. Each in-office treatment session typically lasts 15-20 minutes. The Kybella treatment is customized by the physician to the patient’s aesthetic goals for an improved chin profile. Up to 6 treatments, no less than 1 month apart, may be administered. The actual treatment is usually completed in approximately 10 to 15 minutes. However, we do apply a topical anesthetic on the treatment area prior to the procedure. So, the entire time in the office for Kybella treatment is typically around 30-45 minutes. Most patients tolerate Kybella treatment very well. There is a slight burning sensation when the medication is injected and for about 10-15 minutes after the procedure. Then, the treated area may be slightly tender to the touch for a few days to a few weeks. There is no go-to approach for the number of treatments as the amount of treatments required will vary significantly from person to person. Most patients need at least two treatments; however, some may need additional treatments. Typically, the amount of product needed for each treatment will decrease in subsequent treatments. In the pooled, pivotal Phase III studies, 68.2% of patients responded to Kybella treatment based on a composite of validated physician and patient measurements. Many patients experienced visible results in 2-4 treatments. 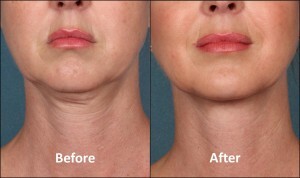 Kybella treatment resulted in high patient satisfaction. In clinical studies, 28%, 43% and 55% of KYBELLA-treated patients had a ≥1-grade composite improvement after 2, 3 and 4 treatments respectively. Patients also reported improvement in the emotional impact of submental fat or “double chin” when asked how happy, bothered, self-conscious, embarrassed, old and overweight they felt following Kybella treatment in relation to the amount of their submental fat. The results of Kybella are deemed long lasting and irreversible, because the fat cells that are destroyed are removed from the body. The safety and efficacy for the use of Kybella treatment for fat outside the submental region has not been established and not recommended. Production of Kybella is highly controlled, quality-assured and validated, current Good Manufacturing Practices-compliant processed to ensure patient safety. Also, KYBELLA contains no human or animal-derived substances. Most patients tolerate and respond to Kybella treatment very well. As with any injection, there is always a risk of some bruising. There will be some swelling, and the amount of swelling is generally dependent on the amount of subcutaneous fat that was treated. The swelling can last for a few days to a few weeks. Pain, numbness, redness, and tenderness following Kybella treatment are to be expected as well. While a Kybella treatment removes a number of fat cells in the submental area, there are still some fat cells remaining. If you gain weight, those remaining fat cells can still grow and expand. However, there are less fat cells remaining, so the fullness should be to a lesser degree if there is significant weight gain. What are the possible Kybella side effects? The safety profile of Kybella is well-characterized and easy to follow. Side effects may include swelling, bruising, pain, numbness, redness or formation of small areas of firmness. Adverse reactions with Kybella infrequently resulted in discontinuation from study (1.6% of participants). Care must be taken when injecting Kybella to avoid the risk of marginal mandibular nerve injury and dysphagia among other risks.